The price tag could be even less, the president said in comments that came as Congress negotiates over a year-end spending bill. 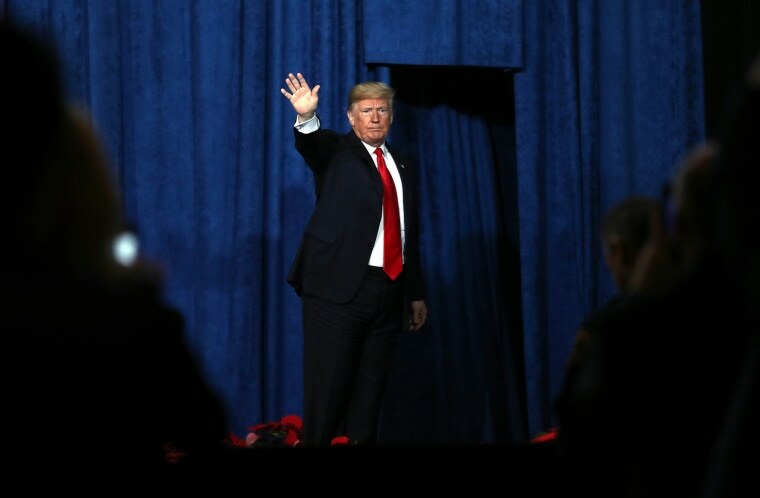 WASHINGTON — President Donald Trump said Friday that a wall between the U.S. and Mexico could cost as little as $15 billion and pay for itself in as little as a month, a departure from the $25 billion barrier he once promised would be underwritten by Mexico. Earlier this year, his administration sought $18 billion for the initial phase of wall construction over the next decade, covering a portion of the southern border. "We’re talking about a wall for $20 billion, $15 billion," Trump said at a Project Safe Neighborhoods conference in Kansas City, Mo. "I could even do it cheaper if I have to, and it will be better than anyone’s ever seen a wall." Trump, noting that most heroin comes across the southern border and that his Council of Economic Advisers has estimated that the cost of the drug — including lost earnings from fatalities — was over $200 billion in 2016 alone, claimed that the installation of a barrier would be quickly offset by the savings that resulted from limiting the flow of narcotics. "You’d make it up in a month — a month — by having a proper wall," he said. Most independent estimates of the cost of opioids do not include the expected earnings of those who die from overdoses, and the president did not offer a dollar figure for how much money the federal government would actually reap in a month from staunching the flow of drugs. But on the same day that he signed a two-week extension of federal funding for most agencies — which were due to shut down without a stopgap measure — Trump appealed to lawmakers to put money into the wall. "Congress must fully fund border security in the year-end funding bill," he said. Still, he said, law enforcement officers are able to deal with efforts by undocumented immigrants to cross into the U.S., even without a wall. "Our great people are able to easily handle it," he said. "Without the wall, it gets tougher. But you know what, they still handle it." Trump's various efforts to combine wall funding with the rewriting of the laws governing legal immigration have failed so far in Congress, and the idea of building a physical structure across the southern border has been a non-starter with Democrats, who will control the House in January.